Do you know, most of my childhood I grew up thinking I didn’t like pancakes. I loved french toast (some day I’ll have to share my secret to the best french toast you’ve ever had), and big fluffy Belgian waffles dripping in strawberries, all the way down to a frozen waffle with a dribble of Mrs. Butterworths. But NOT pancakes. I guess my mom was never a fan, because I don’t remember her making homemade pancakes….but I DO remember staying over night with a friend who’s mom made us whole wheat pancakes for breakfast (before eating healthy was cool)….and I distinctly remember feeding them to the dog under the table, and a few bites went into my napkin. Well, I don’t remember when I gave pancakes a try again, but I know I was an adult, and they are now something I enjoy and cook quite often for my own family, whether they’re spooky pumpkin pancakes, low cal fiber pancakes, or even just quick shake ‘n pour pancakes. I like them all! A perfect lazy Sunday morning breakfast! (or dinner), served with cinnamon honey butter is the “finishing touch”. It’s quick and easy to make, so I recommend you don’t skip it! When I saw AshleyAnn’s buttermilk pancakes, I knew that’s what I needed to start with. Summary: Even more delicious when served with cinnamon honey butter. In large bowl mix egg and milks and oil until well combined. In another bowl, whisk baking soda, baking powder and sugar. Add to wet ingredients. Add flour a little at a time, until batter is runny, but not watery (I used about 2 cups maybe a little less) don’t over mix (lumpy batter is desired). Heat griddle or pan to 350° (or medium). Grease with a little butter or no stick spray. Add 1/4 cup batter to preheated pan, for each pancake (don’t over crowd). 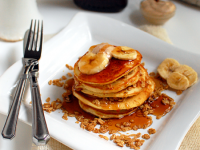 Sprinkle each pancake with granola and top with banana slices. Cook for 1-1/2 to 2 minutes before carefully flipping. Serve immediately with cinnamon honey butter and maple syrup. *If you don’t have buttermilk on hand, add 1 tablespoon of white vinegar or lemon juice to 1 cup of milk and let sit 5-10 minutes. I’d love to hear about your favorite pancakes! 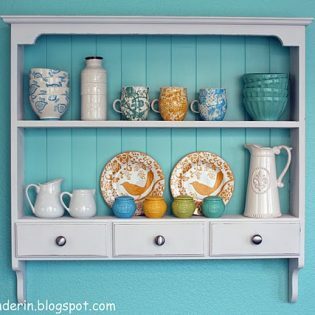 **I’m so excited to be guest posting today over at Family Fresh Cooking. 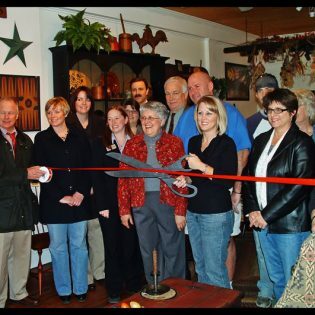 Come by, say hello and check out Marla’s gorgeous spot on the web! YUM! Would love to wake up to these every morning! I can’t wait to give these a try! Those pancakes sure looked good in Park City. Pancakes are a favorite breakfast treat around here. very very yummy! Pretty pics too! 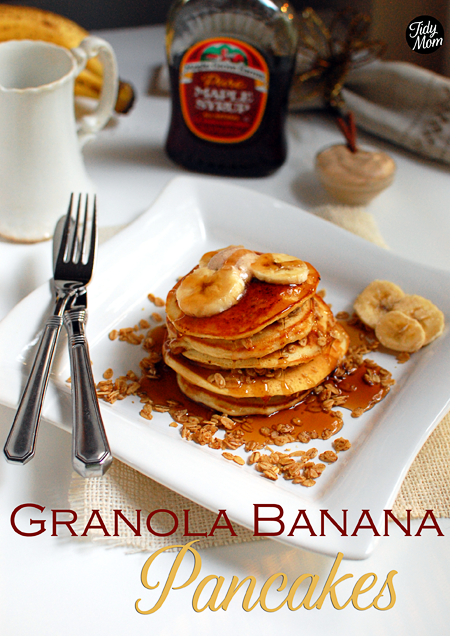 Who could have made granola banana pancakes? Ofcourse you! Such a genius idea and they look so freaking gooood. We make pancakes fairly often here, using a buttermilk recipe I got from a friend a long time ago. It’s pretty similar to yours, except I always add some cinnamon – and then vary it with different added fruits. Different every time, but always delicious. Yours sound super yum with the granola & bananas. And HONEY BUTTER – my favorite kind of flavored butter! I have a favourite pancake that is made with apples and cinnamon and leftovers can be safely frozen and thrown in the toaster when the craving hits. These banana pancakes are making me crave for breakfast for dinner tonight. Seriously Cheryl, they look awesome! I love this concept! 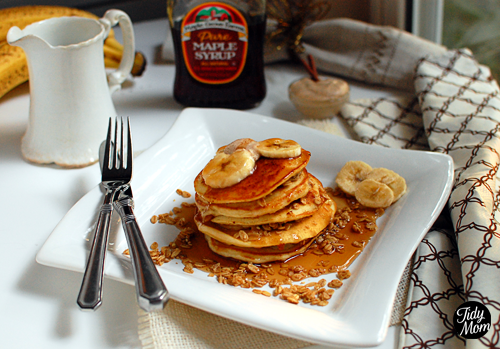 Pancakes, bananas, and granola. WHat a great way to start the day! I have a pancake recipe that uses apples and cinnamon, it is delicious and the best part is that you can safely freeze any leftover cooked pancakes and just pop in the toaster when you want them again. 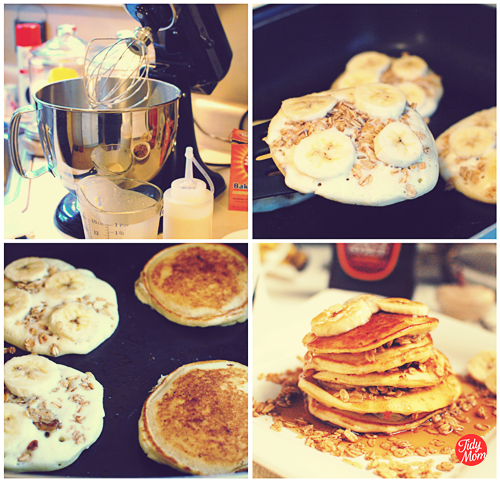 These banana pancakes I’ve never tried before but your pictures are making me want to have breakfast for dinner! Cheryl, Your pancakes look amazing, and the cinnamon honey butter is a MUST TRY! I really like chocolate chip pancakes, but I sure want to try the gingerbread pancakes. I’m sure I would love them! I cannot wait to try these, they look like pancake perfection! from one pancake lover to another…these look delish(and I don’t even like bananas and I want these)! I really was “turned off” by the ad on your blog for cable sweaters. It kept flashing alternate pics of a young girl laying on a bed, and seemed entirely inappropriate. It just didn’t seem to go with your blog, and just kept flashing as I tried to read the recipe. Just some “food” for thought. These caught my eye right away! I have been making my own granola–loving it–and this would be another perfect way to eat it. Thanks!